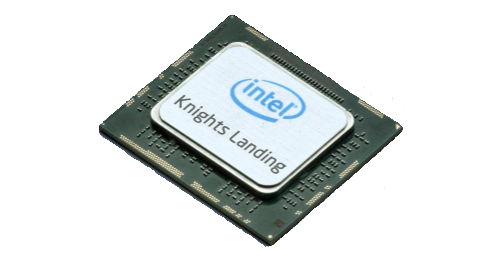 Intel’s Knights Landing processor is the latest generation of the Xeon Phi many-core processor family. It is a host processor, x86 binary compatible, so it can host any box-standard x86 operating system. It comes with 64-68 cores, high-performance stacked memory, and a 512bits wide vector unit – designed for massively parallel workloads. The Xeon Broadwell server processors on the other hand have less cores count, but invdidual cores are more powerful cores, each with a more sophisticated microarchitecture, making them suitable for general purpose workloads even with a low level of parallelism. In the following, we compare the performance of the Xeon Phi Knights Landing to a dual-socket Xeon Broadwell using selected applications from the Xcelerit Quant Benchmarks. 1Note that the FLOPs are calculated by assuming purely fused multiply-add (FMA) instructions and counting those as 2 operations (even though they map to just a single processor instruction). Full SIMD instructions are assumed. A key feature of the Knights Landing processor is that it comes with a stacked MCDRAM memory of 16GB. This memory is directly attached to the chip and has a much higher bandwidth than the main memory (400+ GB/s). It can be used as a cache, as memory, or in hybrid configurations. We observe that the Knights Landing processor gives a boost between 0.6x and 2.3x over the the Broadwell (1.7x on average). It is faster for most applications, but looses with the binomial pricer. Most of the applications benefit highly from Knights Landing’s MCDRAM. Being able to access data at more than 4x the speed as Broadwell makes a huge difference and allows to keep the cores better utilised. For the binomial pricer however, the application is highly compute-bound on both processors and memory bandwidth makes little difference. In fact, on both platforms, disabling hyperthreading increases performance significantly for this application. The arithmetics are able to fully utilise all of the physical core’s resources and hyperthreading only creates contention. The 36 sophisticated cores of the Broadwell system deliver 1.6x higher performance than Knights Landing’s 64 cores.